When I first ate at Shi Xiang Ge 食香阁 on the second level of Bishan Bus Interchange in 2016, I thought this stall would be famous and I had better write about it soon. But I procrastinated (as usual) and it really got famous by word of mouth. Now the stall expanded to take up two shop spaces, and they even change the bowls to be more classy. They used to have the beeper system–they gave you a beeper, and you collected the food–but now they have a LCD screen to call your number. Nobody ate here when I was eating, but now the queue is horrendously snaking. This is just to say I have good taste. Haha. I read on Facebook that the chef had a supervisory role at Crystal Jade for more than 10 years and came out to open his own stall (although I can’t be sure that this information is true). The stall sells la mian (hand-pulled noodles) and dao xiao mian (knife-cut noodles). They make the dough themselves and you can see a strong man in wifebeater kneading and stretching dough. Much labour is put into making the dough; not an easy job. 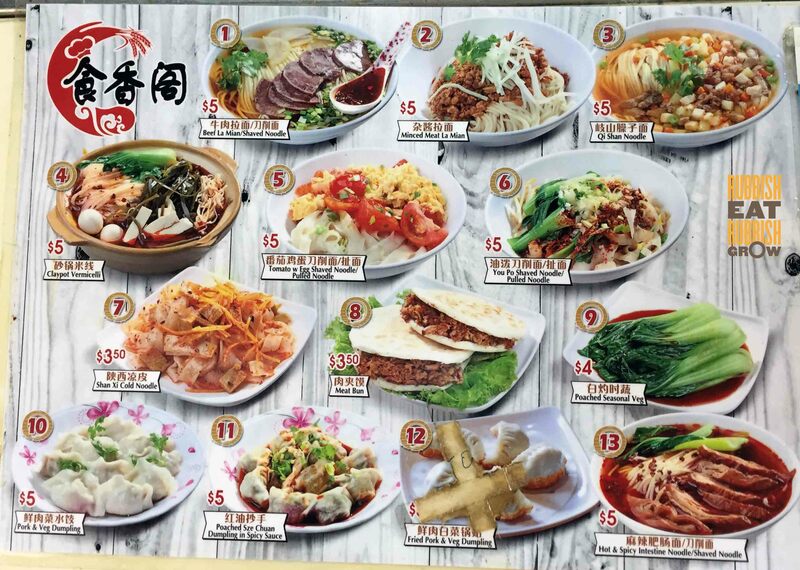 There are 12 items on the menu, mostly noodles in Shan Xi/ Sichuan style. Over time, we have tried 8 dishes. All their portions are hearty. They say American portions are huge, but so are China portions. Their most famous and popular noodle is the beef la mian or shaved noodles ($5), which comes in a mild beef broth and quite a few slices of beef. They also give an option of chilli by the side and some people stir the chilli into the broth. The broth on its own is nice and sweet, but a little weak, and the chilli gives it an edge. The chilli isn’t very spicy, but there are much aromatics in it. Zha jiang mian ($5) is, from my observation, their second most popular noodles, and many people order it with the pork and veg dumplings (10pcs/$5). I like more vinegary and sourish zha jiang mian, but this one isn’t. The strength of this zha jiang mian lies in how bouncy and textural the noodles are. They also have a Shan Xi cold noodle 山西凉皮 ($3.50), which is enjoyable during hot weather. It’s nice, with an appetising sourness, great for people who don’t feel like eating much. The ma la big intestine la mian or shaved noodles ($5) is probably their third most popular noodle; I see many PRCs ordering it, not so much Singaporeans. It’s very spicy, but you can adjust the spice level through 微辣 (mild), 小辣 (slight), 中辣 (medium), and 大辣 (very). We ordered only 微辣 (mild) and we LS already; this is really quite spicy. “Go big or go home” doesn’t apply here; start small. The big intestines have a very strong gamy stench, and my mouth stank after eating it. Seriously, don’t take MRT after eating it; the whole carriage will stink of your mouth. But fortunately, the mala overpowers the gamy stench, making it somewhat palatable. The noodles hold its own in the spicy broth, and can still give that pleasant, sweet wheat taste. To be adventurous, we ordered the Qi Shan noodles 岐山澡子面 ($5), which tastes like a Sichuan cai 四川菜 soup, salty and just a bit of spiciness, with bits of pork belly. Not too bad. They also have a Chinese burger, 肉夹馍 ($3.50 each piece). (Seriously, the West should stop stealing things from China, tea, pasta, gunpowder, homosexuality, and now burger?!) It’s two pieces of dough, that are pan-fried, sandwiching shredded pork in a savory-sweet sauce. The pork is slightly gamy here, but as a whole, it is super delicious and there is a beautiful contrast of textures between the crispy bun and tender pork. The piece is quite filling, so although it is quite expensive at $3.50 a piece, you can just eat this for lunch, and it’s packed with proteins. You may think that they may cut corners and the hong you cha shou 红油抄手 ($5) is just pork and veg dumplings ($5) in a spicy mala Sichuan sauce. But they actually take the effort to present two different things. The dumplings in hong you cha shou has a much thinner skin and the filling is mostly meat. It comes in a superb sauce, that starts off with being savory and becoming spicy. Both poached dumplings and hycs are good, but if you can only choose one, get the hycs for more oomph. Thanks for bringing attention to this stall. It offers a delectable cuisine not easily found in Singapore. Understand that traditional 肉夹馍 is made with pork. Beef would be an interesting twist, can you confirm it was beef? Hello. You’re definitely right! I am 90% sure it’s pork, not beef. Sorry for the mistake. I’m dyslexic and sometimes in my brain I confuse things (like I have an excellent sense of direction but I cannot tell the difference between “right” and “left”). I dunno why in my brain I kept thinking the stall is halal (it is not halal), so my brain told it was beef.